The Gippsland Basin is one the most studied groundwater basins in the world due to the combined negative effects from decades of conventional hydrocarbon extraction in both offshore Bass Strait and Latrobe Valley open cut coal mines. The Latrobe Aquifer System is a large sedimentary basin of approximately 42,000km, which underlies south-eastern Victoria and part of the Bass Strait. Mining has had the biggest ecological footprint in Victoria due to subsurface overdraw on the Latrobe Aquifer groundwater system which is increasing and not sustainable. Mining in Commonwealth waters has drained the groundwater and depleted the aquifer from onshore State jurisdictional control. any other significant report/study relevant to overdraw of groundwater in Australia? So, why are our politicians, both Federal and State, deliberately avoiding the discussion? BECAUSE NO ONE WANTS TO SUE ESSO!!! The very important Independent Expert Scientific Committee (IESC) on Coal Seam Gas and Large Coal Developments makes a great little synopsis of what subsidence is from an overdraw on groundwater. or the PDF of the same information. But then state, 'there is no documented evidence of subsidence occurring from coal seam gas developments in Australia' when dewatering of Latrobe Valley open cut coal mines is drawing groundwater from a coal seam and not make a connection. You cannot remove a mass volume be it water, oil or gas without creating a void that either causes compression (subsidence) by the weight of overlying sediment layer or a reduction in formation pressure. In offshore oil and gas production, water is extracted as a by-product of the mining process. Extracting groundwater has two distinct impacts on the environment. The first is the actual decline in groundwater availability and levels to use for irrigation, stock and domestic bores. Onshore groundwater levels in the Gippsland Basin have declined by an average of 1.1 m per year since 1975, and are continuing at the same rate with no sign of reaching a new equilibrium. The second impact of groundwater extraction is depressurisation of the aquifer system. This is due to the extraction of both on- and off-shore fluid (including the oil and gas itself) and has important effects on groundwater levels and land subsidence. Subsidence of up to 2.8 m has already occurred around the coal mines in the Latrobe Valley, with the potential for further subsidence. This is what we already have in Gippsland yet the ordinary person believes that conventional gas extraction is harmless. This all comes at a cost to the taxpayer who are totally oblivious. >Document is oversized for website so go to contact us and the document will be emailed upon request. It appears that as a result of the above report the order was given by ‘someone’ in government to cease collecting data from monitoring wells installed along the Gippsland coastline in 1992. The monitoring bores were recommissioned around 2002 under State Labor Government when the Gippsland Coastal Board (GCB) got dragged into the increasing awareness of all was not right in 2000. They requested the report and convened a public meeting at Yarram in the April and dropped the bombshell that statistical data was no longer being monitored. On the back of agitation by Yarram farmers because of falling groundwater levels the government commissioned CSIRO to investigate. The Hatton report - Falling Water Levels in the Latrobe Aquifer, Gippsland Basin: Determination of Cause and Recommendations for Future Works is the report that determined the Yarram Irrigators should be compensated for restructuring of irrigation infrastructure and that the Federal government with off-shore oil and gas extraction was responsible. Recommendation 8 - The Committee recommends that the Commonwealth should, as a matter of urgency, address the impact of Commonwealth-licensed oil drilling on the Latrobe aquifer and propose solutions which respect the rights of groundwater users. Response: The report concludes that water levels in this aquifer have been falling for several decades, impacting on irrigators and potentially on the wider community through land subsidence. Payment methodology for compensation. Latrobe Aquifer Impact Investigations - Information on Assistance Measures Unfortunately, it seems more farmers are suffering but compensation will be denied as this program finished in 2009. State government (our taxes) foots a bill but ESSO/BHP are spared liability. Climate Change, Sea Level Rise and Coastal Subsidence along the Gippsland Coast: -Implications for geomorphological features, natural values and physical assets. Along the Gippsland coast, the dual effect of projected sea level rise and potential coastal land subsidence will cause increased flooding and have a potentially catastrophic impact upon natural resources, physical processes, infrastructure and physical assets of built up areas, and upon recreational opportunities experienced along the coast. Let's hope or governments have not destined us to the triple whammy with pressure from subsidence and ongoing mining causing more earthquakes. Over the last few years, terminology has changed from land subsidence to coastal inundation from sea level rising caused by climate change which is totally different from subsidence which is land sinking. Conveniently, the government commissioned VPELA (Victorian Planning Environmental and Lawyers Association) to prepare the state for legal implications of climate change. They state that land claimed by the sea falls under the doctrine of diluvion. As such, government is not responsible for compensation. Victorian State Coalition Govt hid the Morwell Land Movement Survey report from the public because they didn't like what it had to say about the movement in and around the Morwell Mine. This report was commissioned due to the main connecting freeway collapse bordering this mine. FOIs have been unsuccessful but a panel report written for the Latrobe City Council Latrobe Planning Scheme Amendment C87 Traralgon Growth Areas Review (highlighted pages 11-21) notes commentary from one of the authors of the hidden report and declares all the geotechnical complications that exists from three open cut coal mines in Latrobe Valley - makes for interesting reading. The 2014 release of this subsidence monitoring document has declared minimal movement on the coast. Surprise, surprise given the use of European satellite imagery from 1992 while noting that it was not accurate. Continuity with data collection is a real issue of integrity but more worrying is the monitoring sites noting what areas are outside satellite imagery. The deception continues. Local knowledge gives a total different view of the issues depending on which monitoring points are used. COM have photos that show a gas rig well onshore in McLoughlins Beach in the 1950's but by the '80s the well head is on the foreshore and now is on the third breaker out to sea unmarked because govt do not want to highlight how much the land has dropped. You can't move landmarks that previously were not impacted by the sea but now are. Erosion is ever growing. Subsidence well over 2 metres has been recorded over an area of several square kilometres near Morwell as a result of the existing open cut mines in Latrobe Valley without even factoring in new coal based industry that both local and state government are actively endorsing. Read short extract about aquifer concerns, impacts and potential solution of aquifer recharge for Latrobe Valley coal mines. Management of aquifer depressurization system in Hazelwood mine, Latrobe Valley, Australia. The concern is that aquifer recharge is problematic in itself as there is no fresh water to recharge aquifer. The only water available is waste water from industry and wouldn't that be convenient for govt to offload that. So for the upper shallow aquifers that do have recharge points into streams we could, in fact, have our potable water sourced from wastewater and topped up aquifers discharging into natural springs and waterways. The other problem is that once subsidence has occurred you cannot undo it. Simply put, subsidence is the sinking downward of the earth's surface compacting to fill a void. The public purse (taxpayer) continues to pay for remediation of damaged infrastructure from land sinking. "The motion in Gippsland here, the rate of earthquake activity is high, the geology suggests that the average over the last few million years is probably even higher,"
Our state government continues to ignore requests to plan for coastal change and be proactive to subsidence as they further expand hydrocarbon production both offshore whilst promoting onshore natural gas developments. The government has no alignment of principle legislative objectives and clear policy direction to enable informed and consistent decisions that can ensure any future development is based on sound and adequate risk management in light of climate change impacts to lowlying areas of the Victorian coast. 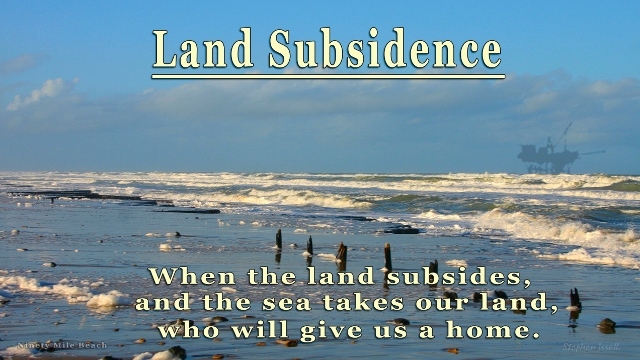 So, how will government reconcile the cost burden to the taxpayer if they ignore the magnitude of the risk and its consequences in favour of an expanded industry that will further exacerbate land subsidence?